/ Modified mar 12, 2019 10:59 a.m.
Cesar de Leon, with Sonora's game and fish department SAGAHRPA, preps a game camera before installing it. It’s late afternoon on El Rancho Las Aguilas, a roughly 10,000-acre spread in northern Sonora within sight of Arizona’s Huachuca Mountains. On a steep, oak-covered hillside, Cesar de Leon and a colleague from SAGARHPA — the Sonoran game and fish department — are clearing away brush with a machete and handsaw. “Before installing the camera, we need to do a little cleanup to prevent the vegetation from setting it off,” he said. With the help of a cable lock, bungee cord and some well-placed sticks, they got the game camera in place and shot a test image. That camera is one of 30 they recently installed on the ranch as a part of a large species inventory effort. Thirty more will soon be placed at another Sonoran ranch. The project represents the first time that De Leon’s agency, SAGAHRPA, has had access to private ranches for such installation. The cameras came from the Arizona Game and Fish Department, which is a partner on the binational project. Unlike Arizona and much of the American West, where states or the federal government control most land, almost all of Sonora is privately owned. That means buy-in from ranchers and other landowners is critical for species monitoring. Without game cameras, such monitoring can be very time intensive and less effective. 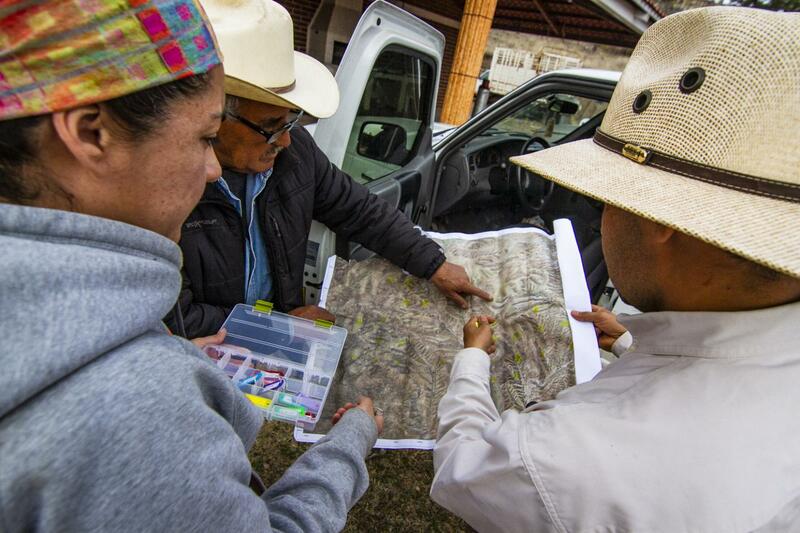 VIEW LARGER Arizona Game and Fish's Cynthia Soria (left to right), Carlos Ballesteros and SAGAHRPA's Cesar de Leon plan where to set up game cameras next. For Luciano Leon, owner of Las Aguilas, those benefits were obvious. He also hopes to eventually be allowed to run hunts on the property, and the game cameras will help him establish that populations of certain species are high enough to do so. Driving with Mexican counterparts to several installation sites, Arizona Game and Fish’s Cynthia Soria says many species’ territories span the border. Having access to game cams on both sides of the border could help her agency better understand those animals. 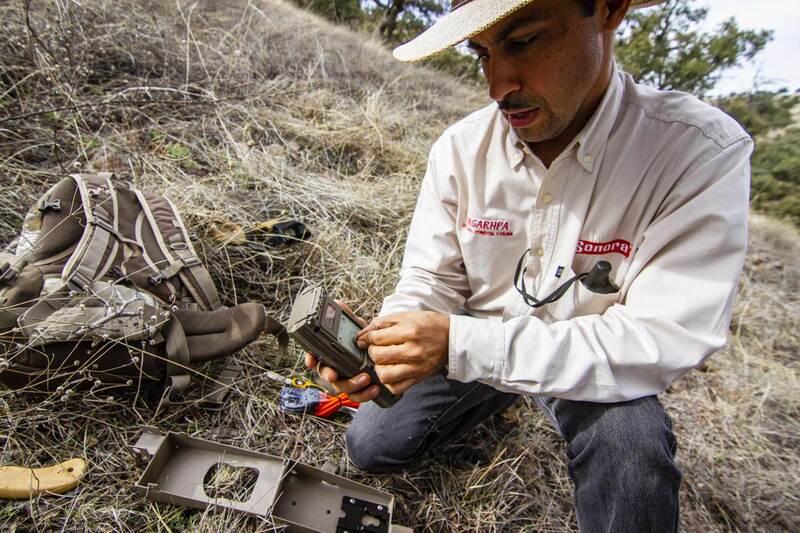 The recent installations are by no means the only game camera systems in Sonora. A number of border ranches have allowed researchers and nonprofits to set up camera traps. David Hodges has been involved in borderlands species conservation efforts for many years. He applauds the recent installations. “Just because there's already a lot of cameras out there, doesn't mean we can't learn more,” he said. 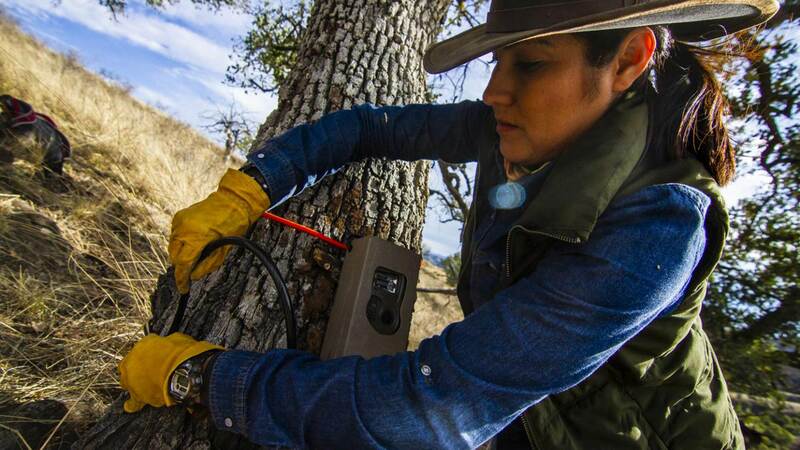 The Sonoran Ecology and Sustainable Development Commission's Shandira Romero finishes installing a game camera. Back at Las Aguilas, Soria and her Sonoran colleague Shandira Romero with the state ecology commission are putting the final touches on the last game cam of the day. Getting the correct angle took a bit, but they eventually got it pointed the right direction. After gathering up all their gear, Romero smudged some dirt on the camera, to cover up its color and smell. The binational team then walked back to their waiting truck, leaving the camera to quietly document any animals that cross its path for months to come. 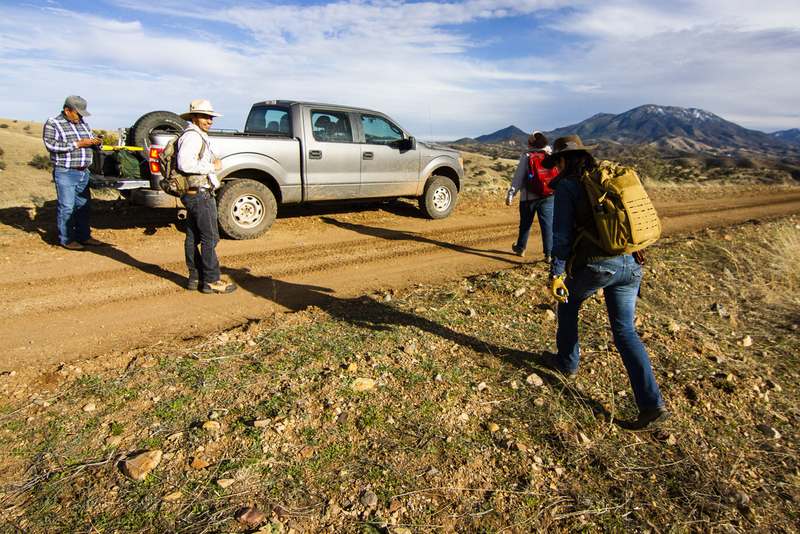 The binational team walks back to their truck after a long day installing game cameras in northern Sonora.